This tasty treat is easy to make, and a great dessert for when your mother is out of town. This recipe was created the first night our mother was gone. First, mix the graham crackers and sugar in a medium mixing bowl. Then you want to melt the butter and pour that in. Mix until what is in the bowl is a medium brown, crumbly substance. You put that in a 9 inch pie pan, and press it evenly against the sides. Bake for 8 minutes at 350. Allow the crust to cool before filling. 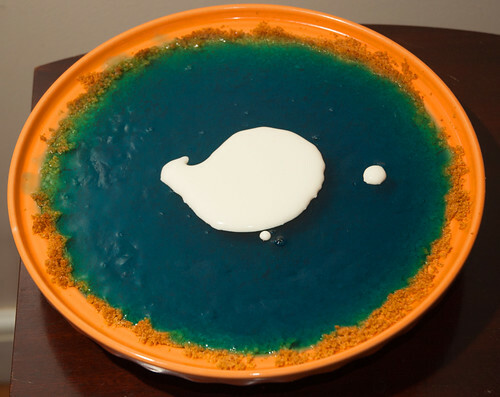 While that is baking, start to make the jello. You want it to be thick, but not solidified when you pour it in the crust. This can also be done before hand if you read directions and feel like planning and stuff (even though we didn’t). Then you’re gonna pour it in the crust (as if you hadn’t already guessed) and put it in the fridge and stuff like that, to let it cool and get all awesomely solid and stuff. A lot later you’re going to freak out and realize that you forgot all about it, and you will be wondering what the heck you do next. I can help with that. You put on your whipped cream, and then you eat it all and get amazed at how totally awesome it is! Yes, but is it as awesome as the cherpumple? I think Dr Seuss pie sounds much better than cherpumple!